For many years, before official stamps were used, the Post Office charged each Government Department postage on the estimated amount of mail handled. The Government Life Insurance Department in 1890 objected to the bill it received and from that point on issued its own stamps. 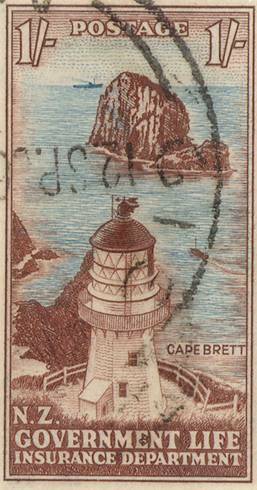 In 1947 it issued an attractive set featuring mainly New Zealand Lighthouses, one of which was of Cape Brett.